The Winnipeg Jets play the first half a two-game road trip tonight in Nashville against the Predators…The Jets beat the Vegas Golden Knights 4-1 on Tuesday night to sweep a three-game homestand…The Jets play the second half of the road trip on Saturday night against the Dallas Stars. The Jets are 12-8-0 on the road this season and have lost back-to-back road games…Winnipeg has lost back-to-back road games on three occasions this season, but haven’t lost three consecutive road games in regulation since Dec. 10-20/16…Blake Wheeler leads the Jets in scoring on the road this season with 22 points (3G, 19A) in 20 games, while Patrik Laine has 16 goals in 20 games. After allowing a power play goal in six consecutive games, the Jets are a perfect 8-for-8 on the penalty kill in their last two games, including going 6-for-6 on Tuesday against Vegas…Tuesday was the third time this season the Jets have given their opponents six or more power play opportunities in a game and Winnipeg is a perfect 21-for-21 on the penalty kill in those games. In their 46th game this season, the Jets improved their record to 30-14-2 on Tuesday, which establishes a franchise record for the fewest games needed to reach 30 wins…Last season, the Jets were 26-13-7 after 46 games, putting them three points ahead of last season’s pace…Winnipeg won their 30th game last season in Game 51, which was the previous franchise record. The Jets allowed 40 shots or more in two of the three games in their three-game homestand, but are a perfect 8-0-0 this season when allowing 40 shots or more…The Jets are averaging 27.6 shots in games they allow 40 or more shots…Winnipeg allowed 40 shots or more in nine games last season, going 3-4-2. The Jets are in the midst of nine games (5-2-0) in 16 days leading into the player and all-star break from Jan. 20-27…After the all-star break, the Jets also have a busy schedule with 11 games in 20 days. The Jets are 9-6-0 against Central Division teams this season…Since the start of the 2016-17 season, the Jets are 43-23-4 against Central Division teams, which is first in the NHL…In that same time frame, Blake Wheeler leads all NHLers in scoring against the Central Division with 91 points (27G, 64A) in 70 games, while Mark Scheifele is second with 84 points (34G, 50A) in 62 games. Bryan Little is in his most productive month of the season with eight points (4G, 4A) in six games, which has surpassed the six points (2G, 4A) in 15 games he had in December…He has scored four of his 10 goals on the season this month and has a 36.4% shooting percentage…Little scored the game-winning goal for the Jets in two of the three games during the homestand. The Jets have two players on six-game point streaks…Mark Scheifele (2G, 6A) and Bryan Little (4G, 4A) have eight points in the past six games…Blake Wheeler is on a three-game point streak with five points (2G, 3A). Blake Wheeler tallied his 50th and 51st assists of the season on Tuesday…It’s the second consecutive season in which he has 50 assists and third time in the past four seasons…Wheeler holds the franchise record for career assists with 374…His 219 assists during the past four seasons are the most in the NHL…Wheeler had a career-high 68 assists last season, but is on pace for 91 assists this season. Goaltender Laurent Brossoit made 43 saves on Tuesday to improve to 10-1-1 this season and 10-0-1 in games he has started…Brossoit’s 2.01 goals-against average and .943 save percentage are tops in the NHL among goaltender that have played in at least 12 games…He made 26 saves in the second period on Tuesday to set a franchise record for most saves in a period…Brossoit has made 11 starts this season, which is a career high. Kyle Connor had three points (2G, 1A) on Tuesday against Vegas for his second three-point game in his last three games…After going 10 games without a point from Dec. 13-Jan. 4, Connor has nine points (5G, 4A) in his last six games. Jets forwards Blake Wheeler and Mark Scheifele have been selected to represent the Jets as members of the Central Division team at the 2019 NHL All-Star Game…Wheeler, who is making his second consecutive all-star appearance, leads the Jets in points (60) and also leads the Jets and ranks tied for second in the NHL in assists (51)…Scheifele is making his first all-star appearance…He is tied for first on the Jets in goals (25), assists (33) and points (58)…He is also in the top 15 in the NHL in goals and points…Head coach Paul Maurice has been selected as the head coach of the Central Division team, based on the Jets being in first place in the Central Division at the midway point of the season. Winnipeg has points in five of their last nine games against Nashville (4-4-1). The seven of the last eight meetings between the Jets and Predators have been decided by two goals or less, with four of those games decided by only one goal. The winning team has scored at least five goals in six of the last 10 games between these two teams. The Jets and Predators combined for 42 goals in their five meetings last season. Since relocating to Winnipeg, the Jets and Predators have played only one game with a combined goal total of two or less (2-0 L on Oct. 17, 2014). 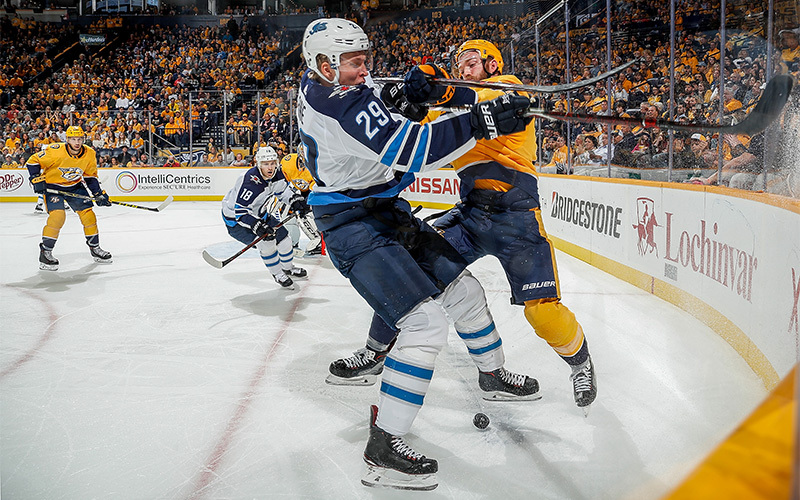 Blake Wheeler leads the Jets in career scoring against the Predators with 24 points (13G, 11A) in 29 games. The Preds’ Ryan Ellis and the Jets’ Tyler Myers won gold together at the 2009 World Junior Championships playing for Canada. Predators’ assistant coach Kevin McCarthy is from Winnipeg. The Predators’ Austin Watson and the Jets’ Andrew Copp are both from Ann Arbor, MI. Jets forward Patrik Laine and Predators goaltender Juuse Saros were teammates for Finland at the 2016 World Championship, winning a silver medal. Needs one point to reach 100 for his NHL career. Needs six assists to reach 300 for his NHL career. Needs four points to reach 100 as a member of the Jets. Needs one game played to reach 600 for his NHL career.